based on Preliminary Exam and Mains Exam. GHC Grade 3 Prelims exam will be held for 100 marks. GHC Grade 3 posts mains exam will be conducted for 450 marks. Interview will be held for 50 marks for this Gauhati High Court Grade 3 posts. GHC Grade 3 posts prelims exam is objective type only. 90 marks questions will be given from the topics of General studies and post related. And 10 marks questions will be given from the Assamese Language to know the candidates language proficiency. 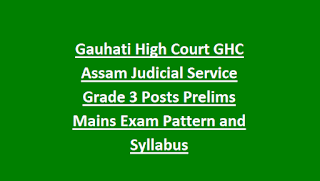 More information about this GHC Assam Judicial Service Grade 3 Posts Prelims/Mains exam pattern and syllabus, Admit Card details are update below. 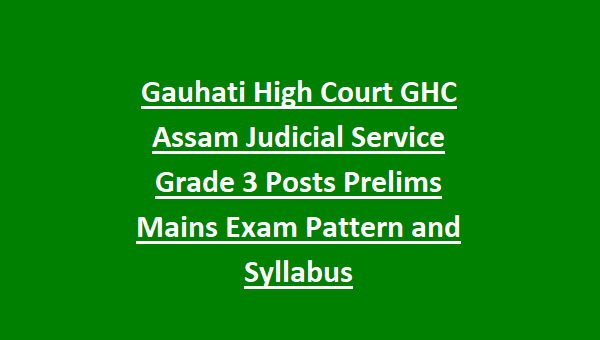 Prelims exam will be conducted for 100 marks for these Grade 3 posts of Gauhati High Court GHC Recruitment 2018. Prelims Exam Consists of two parts.